A classic silhouette gets an update in the Nike Indy Sports Bra, featuring a front zip that makes it easy to take on and off. Thin straps offer a minimal look and breathability ideal for your studio class. Front zip lets you take the bra on and off easily. 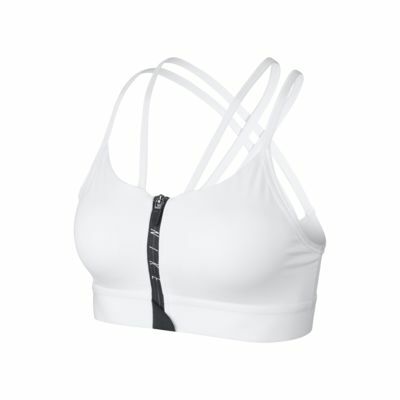 Light support bra designed for low-impact activities such as yoga, Pilates and barre classes. Thin straps offer a minimal look and breathability. Fabric: Body: 88% recycled polyester/12% elastane. Mesh: 81% nylon/19% elastane. Bottom hem: 87% nylon/13% elastane. Mesh lining: 80% polyester/20% elastane. Pad top fabric/pad back fabric: 100% polyester. Pad: 100% polyurethane.